Turning pages while playing a musical instrument takes almost as much talent as it takes to learn to play an instrument in the first place. If you’ve switched to reading music on your laptop or iPad there is a way to make it easer to deal with pages. Sadly this little page turning gadget won’t actually help you turn those paper pages that can be so troublesome. 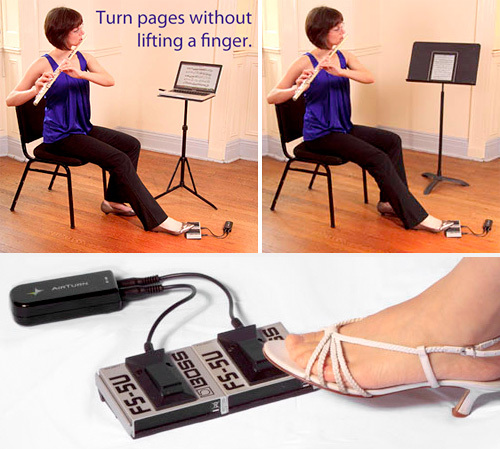 The AirTurn connects wirelessly to your computer as a music reader. To get it up and going you just need to plug the receiver into the USB port of your computer. Then when you’re ready to turn the page you just have to tap your foot on the pedal. It’ll work with most document programs, PDF readers and presentation programs. You can get the AirTurn with pedals for $69.95 to $99.95. It just depends if you want one or 2 pedals. You can also go slightly cheaper and get one for $39.95, but that doesn’t include any pedals.